The Michael Jackson: King of Pop slot is ideal for any lover of the man himself, or his music. It is also worth playing if you wish to see what a proper music themed video slot should look and feel like. 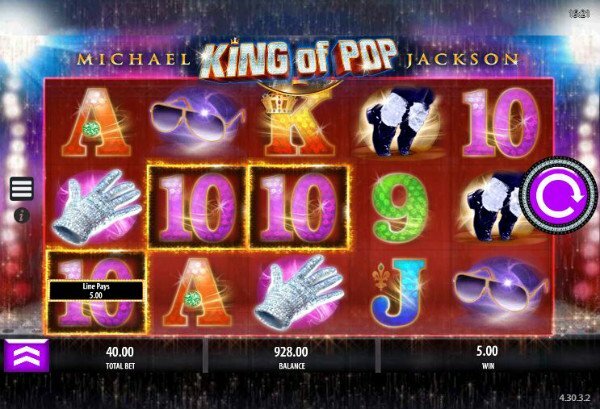 Bally Tech have just announced the launch of their new Michael Jackson: King of Pop video slot. The Michael Jackson: King of Pop slot is the only officially licensed MJ themed game on the net, and it offers a lot. With great graphics, and some memorable Michael Jackson imagery on its 5 reels and 25 lines, Discover Bally Technologies Casino Softwarethis is easily a contender for the best slot of the year. We’ll start our Michael Jackson: King of Pop slot review by taking a peek at some of the game’s graphics. The Michael Jackson: King of Pop slot graphics are phenomenal. Bally Tech have been able to accurately portray Jackson using realistic representations, and if that wasn’t enough, the reels are littered with his “accessories”, too, just for good measure. The Michael Jackson: King of Pop slot machine isn’t going to allow you too much control over your bets, but it is still flexible and cheap. You can expect to be able to adjust your total bet from a low of 0.40 per spin, up to a high of 80.00 per spin on this slot. This makes the Michael Jackson: King of Pop game rather cheap to play. You are still paying more than the number of lines, though, so you will expect good returns with its special features. But what are they? First up, there is a wild icon in this game. It isn’t too stunning in appearance, but it does double as the second best paying symbol in the game, being worth 500x your total bet if you can line up 5 on a payline. Wilds can replace all other icons, save for scatters. At any point during a spin, Moonwalk wilds may appear. They can pop up between 2 and 5 times at random on the second to fifth reels of the slot. Bonus or jackpot symbols appearing between two Moonwalk wilds will then be turned into wilds of their own. It is also possible for wilds to appear stacked during any base game spin. This slot also contains a jackpot icon, and that is the best paying symbol in the game. If you can land 5 of those on a payline, you’re walking away with a top prize worth 2,500x your total bet. 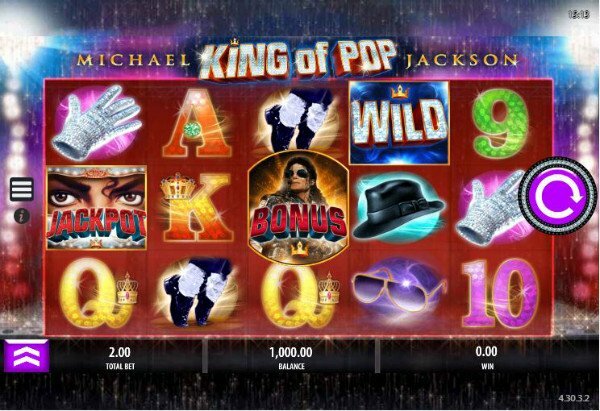 If a player can land 3 of the bonus icons anywhere on the reels of this slot, then they will trigger the Michael Jackson: King of Pop special feature. Bonus icons only appear on the second, third, and fourth reels of the slot. 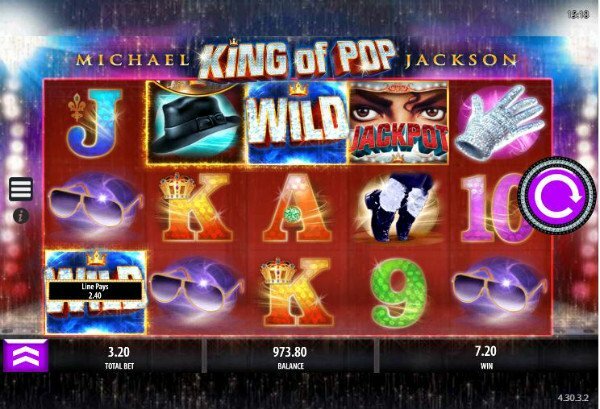 There are several Michael Jackson: King of Pop slot bonuses available, all of which are triggered via a wheel. Once the bonus round begins, players can either land free games, an instant win cash prizes, or a cash prize with another spin on the wheel. There are two free spin bonuses in total. The Beat It bonus offers 10 free games, with sticky wilds. The Smooth Criminal bonus offers 5 free games with increasing stacked wilds on the reels. Every spin you make sees you bag an extra sticky and stacked wild. With a RTP rate of 96%, wins are fairly frequent in this MJ themed video slot. The Michael Jackson: King of Pop slot is ideal for any lover of the man himself, or his music. It is also worth playing if you wish to see what a proper music themed video slot should look and feel like. You have to take your hats off to Bally Tech on this one; this slot machine game is simply a treat to play. Is It a 10 Out of 10Bet Casino Review?